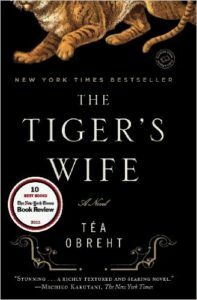 As delightful as the story itself, it is also important to note that this is Téa Obreht’s debut novel. And she is “twenty something.” I was unable to keep track of the artful wording and phrasing she creates on every single page. So, instead of writing down pages to share, I decided just to open to a random page while writing my review, guaranteeing myself I would find a superb example. Let’s try. Okay, page 91. “His thirst insane, the tiger lapped up pools from the leaky fountain where the flower women filled their buckets and then put his nose into the face of a sleeping child who had been left, wrapped in blankets, under the pancake stand.” How can anyone write with such beauty, clarity and eloquence? Read this book! And please, leave a comment! Andrea, I have tried reading this novel three times now and cannot get past the first 1/3 of the novel. I was confused and kept getting mixed up between the reality and the fantasy. After you’ve read it the second time, then please comment again. I REALLY tried to get through it. Reading it now. Really enjoying the writing and the story. Not past the first third though.